Everyone has heard of the Great Barrier Reef off the coast of Australia, but the second longest barrier reef in the world, the Belize Barrier Reef, is becoming as well known in recent years. Located on the western edge of the Caribbean Sea along Belize’s 200 mile coast, the mainland of Belize is protected by this offshore reef. This barrier reef complex runs from the northern border of the country, where it is only about 1 mile offshore, and continues in an almost unbroken line south all the way to the Sapodilla Cayes which are about 25 miles offshore. In 1842 Charles Darwin referred to the Belize Barrier Reef in his writings, calling it “the most remarkable reef in the West Indies”. There are many ways to enjoy the this region of the world, but Belize Barrier Reef snorkeling tops them all. Belize harbors over 70 species of coral, over 200 species of sponges, and almost 450 species of fish identified in Belizean waters. We operate one of the best beach resorts in Belize at Glover’s Reef, where you can snorkel right offshore. Conservation efforts by the Belize government have designated seven areas of protection which comprise the Belize’s Barrier Reef Reserve System. In addition to the Barrier Reef itself, the system includes three offshore atolls, hundreds of mangrove and sand islands (called “cayes” in Belize), as well as numerous estuaries and lagoons. These marine areas protect coral colonies which provide habitat for threatened species. The seven protected areas are the Blue Hole Natural Monument, Half Moon Caye Natural Monument, Bacalar Chico National Park and Marine Reserve, Glover’s Reef Marine Reserve, South Water Caye Marine Reserve, Laughing Bird Caye National Park and Sapodilla Cayes Marine Reserve. This Reserve System was designated a UNESCO World Heritage Site in 1996. All of these areas can be located on one of our free Belize maps. “10 days – we saw a LOT of stuff, Caverns, Mayan ruins, the countryside of Belize, the zoo, a private, remote island, 2nd largest barrier reef in the world, more activities than we could pack in and we went hard from the time breakfast was over until the last beer was drank at night. The guides far exceeded what I expected – extremely knowledgeable about Belize and the culture. 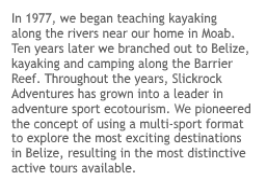 You didn’t just get an adventure trip, you got to experience Belize, the country and people and you got a National Geographic style history lesson that really was exceptional. The Belize Barrier Reef ecosystem is one of the most diverse network of reef structures in the world. Both fringing and barrier reef structures are present in the Barrier Reef itself. 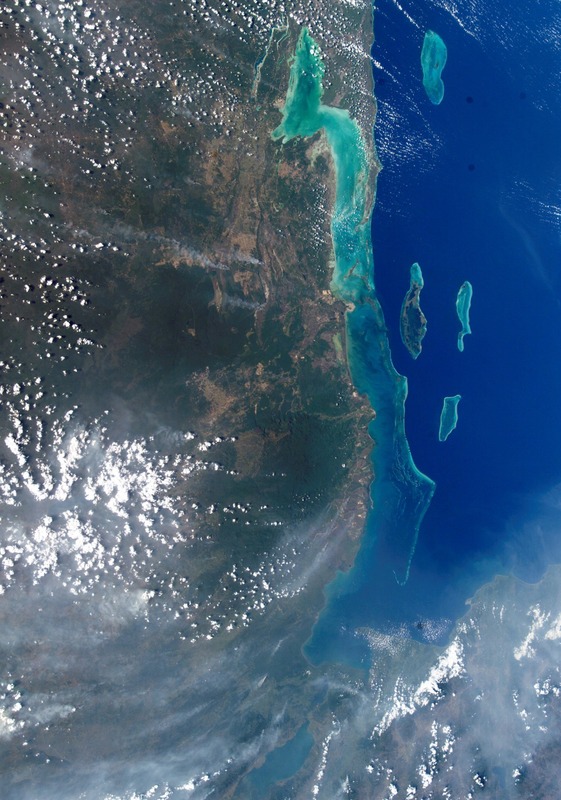 The Barrier Reef rests on the edge of the continental shelf, and is separated from the Belize coast by a vast lagoon. 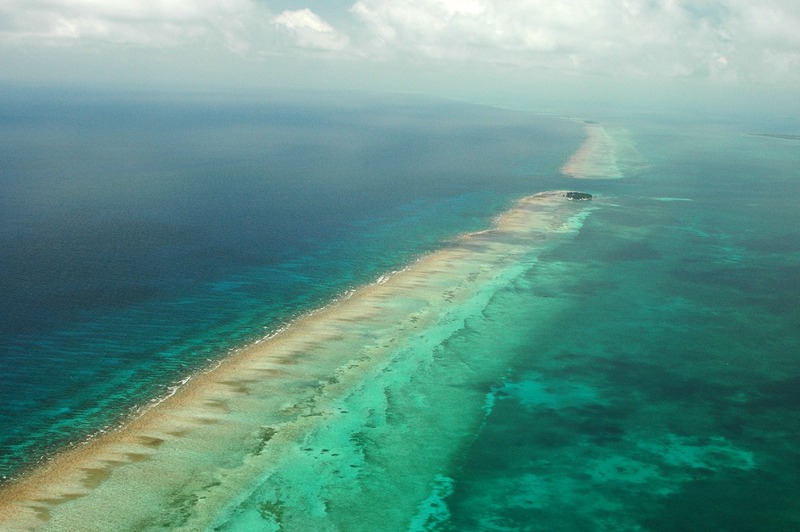 Out past the Barrier Reef lie the three atolls of Belize (Glovers Reef, Lighthouse Reef, and Turneffe Islands). Each atoll contains numerous patch reefs. Most of the world’s atolls are found in the Pacific, where they form on the top of submerged volcanoes. Atolls are rare in the Western Hemisphere. Only four occur in the Caribbean, and three of them are in Belize. Their coral colonies grew on submarine ridges which are a result of the migration of tectonic plates, they are not volcanic in origin. There is great diversity among the creatures of the Belize Barrier Reef Reserve System. A list of healthy populations of imperiled marine species here include the West Indian manatee, three types of sea turtles (green, hawksbill, and loggerhead), and American crocodile. 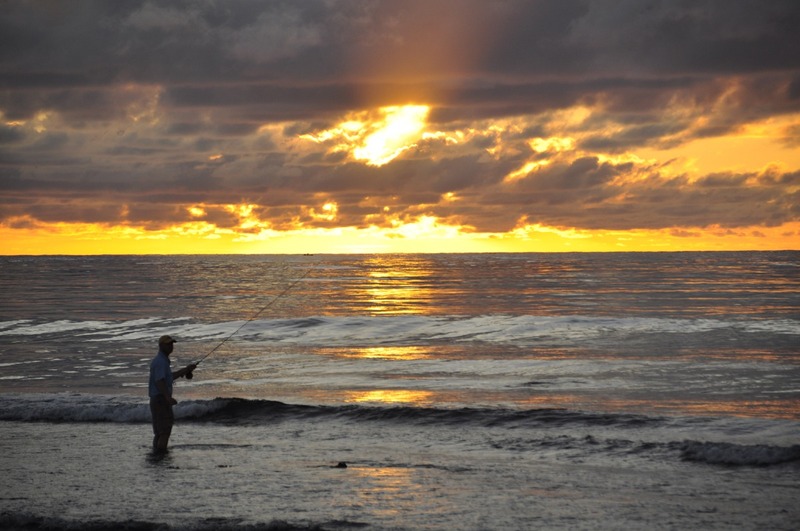 Hundreds of types native and migratory birds, well over 500 fish, 70 species of coral, 45 hydroids, and 350 different mollusks all call the protected waters of Belize home. Mayan sites along the coast (Cerros) and on the southern cayes (Wild Cane Caye, and Middle Caye at Glover’s Reef) provide evidence that the reefs were home for fishermen 2500 years ago. When the Mayan culture declined, the reef system probably went unused for hundreds of years. By the 1600s, Belize’s coast and offshore cayes had become a pirate haven; in fact Glover’s Reef is named for John Glover, a pirate who favored the islands of this atoll. In more recent years, there have been waves of populations, including the Garifunas, immigrants from Mexico and Guatemala, and most recently North Americans and Brits who have been seduced by the beauty of the Belize coast and cayes. By far the best way to get to know this incredible ecosystem is to get out in it! 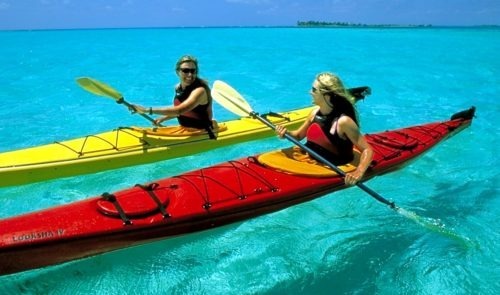 Sign up for a snorkeling vacation, or go kayaking the Belize Barrier Reef.